Local lad Graham Leggat was very much a pin-up for fans of the Dons in the mid-fifties and from his debut in 1953 Leggat quickly built a reputation as a dashing player who could score plenty of great goals and played a key role in securing Aberdeen's first League Title in season 1954-55. His first goals came in a friendly at Pittodrie against Stoke City (played for the Frank Watson memorial Fund) in September 1953 and the first competitive goal was scored a few days later, also at Pittodrie, in a 2-1 win over Partick Thistle. It was only Leggat's second season of senior football when the Dons embarked on their championship winning campaign and with the supporters on a joyous high, it should be no surprise to find that a song about this classy player was quickly composed for the terraces. A very popular song of that era was "The Ballad of Davy Crockett" which had been written for the Disney television mini-series about Davy Crocket and was later used in the film of that name. The tune was quickly adapted with lyrics extoling the ability of Graham Leggat. Star of the A. F. C.
Graham, Graham Leggat, star of the AFC!" 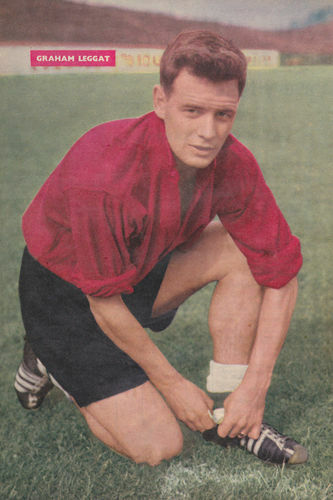 The song couldn't have done Graham's confidence any harm and he continued to star for the Dons until his transfer to Fulham in 1958. During that time, perhaps one of his most spectacular goals was scored in the 1955 League Cup final against St Mirren when he fired a looping shot with his left foot from almost 30 yards and Lornie, the St Mirren goalkeeper, was left floundering as it zoomed into the far top corner, thus securing silverware for the Aberdonians by two goals to one. A series of international caps boosted Leggat's reputation even further and even a leg break did nothing to sour his abilities that demonstrated tremendous speed and nimbleness of thought and deed. His rising star brought interest from south of the border and at the beginning of season 1958-1959 he was transferred to Fulham for the very low fee of £15,000. Unlike many players who move away from Pittodrie, Graham Leggat continued to enjoy a career in the limelight, spending eight years at Craven Cottage before moving on and eventually finding his way to Toronto where he played for the Metros and eventually became a very successful sports' broadcaster. In his five season career at Pittodrie, Graham played a total of 151 competetive matches for the Dons, scoring 92 goals, and securing a very prominent place for himself in the ever expanding history of Aberdeen Football Club.